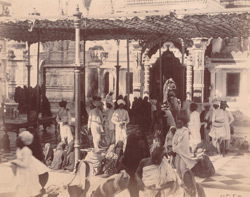 Photograph of a crowd gathered in front of the Adishvara Bhagarai Temple at Satrunjaya, from the Archaeological Survey of India Collections taken by Henry Cousens in the 1880s-90s. Satrunjaya or 'the place of victory' is the most sacred pilgrimage place of the Jains. On the two summits of the hill, which rise 600 m above the plain around the town of Palitana, there are many hundreds of multi-spired temples where every day pilgrims come to pay reverence to the different Jain saints. The sanctuaries are grouped in fortified enclosures or tuks, named after their founders. The Adishvara Temple is situated in the south ridge and dates back to the 16th century. The temple has a double-storey mandapa and a very elaborate spire over the sanctury enshrining a large image of Rishabhanatha.